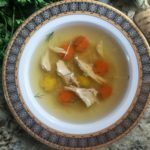 My first taste of Rosół (Polish Chicken Soup) was on a cold and snowy March Saturday. I had just moved to Poznan. I had spent a good deal of time there in the first 18 months Ed had been working there, but now I was a full time resident. We woke up Saturday morning to a few inches of snow. Being from Arizona, I assumed this meant we would cancel all of our plans, stay home, watch the snow come down, and start drinking early in the day. That’s what it would mean in Tucson, on the rare occasions when we get snow, maybe once every 10 years. Ed was quick to point out that life, and daily plans, went on, whether it snowed or not; we had snow tires after all. We made the short drive to IKEA for something and then caught the tram into town, he got his hair cut, we attended the free organ concert at Fara Church (properly called Parish Church of St. Stanislaus). The church was freezing. I think it was colder inside than outside. The cold wasn’t bad while we were walking around, but just sitting, I was starting to feel chilled to the bone. After the concert, we walked through the Stary Rynek (Old Market) and stopped at one of our favorite restaurants for a bite to eat. Ed had already sampled their Rosół (pronounced ro soow) and recommended it highly. It seemed like a great way to warm up. When our waiter brought the soup, he told us that it was very popular for Sunday dinner in Poland when extended family might drop by. Soup does offer that advantage, you can also feed a few more. The broth is rich with a beautiful deep color; it’s also very clear. 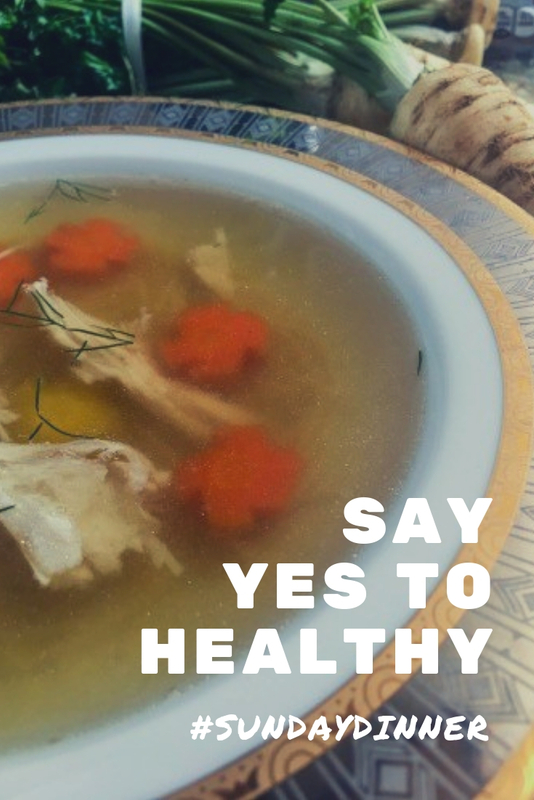 A lot goes into making the complex broth, but only a few of the ingredients make it into the soup, a few chunks of chicken and a couple of carrot slices. It’s a elegant looking presentation. If you decide to add some noodles to the soup, they are cooked separately, added to the bowl and the soup ladled over. This keeps them noodle-like, they won’t swell up from sitting in the soup overnight or make the broth cloudy. This may be the most involved simple dish you’ll ever make, but it’s just soup, so how hard can it be? 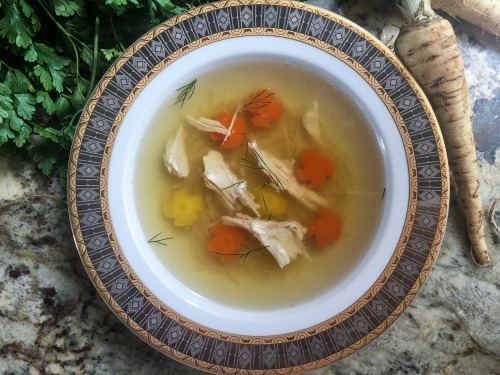 The long list of ingredients gives you the wonderfully rich broth with multiple layers of flavor. Give it a try for Sunday dinner, you’ll be glad you did! Growing up in Chicago we ate this every Sunday without fail. I still make it. It is Polish penicillin! I like to add a few cloves of garlic. My great grandmother prided herself on serving very clear broth. Kluski (noodles) are a natural accompaniment but quite often my mom just cooked Creamettes macaroni for the soup. To get a nice clear broth don’t allow it to boil, just simmer, and be sure to skim skim skim. Thanks, Laurel; I love to hear the family stories around comfort foods! Finally figured out how the name was for chicken soup. In the old days the only way to store meat was to salt (sol) it. Other soups used to carry part of its name with the word for salt, but now only chicken soup. At Reymontowka this is also called wedding soup, because it is served for the wedding receptions held there. The first thing I thought when I saw the photo was, “Her broth is so clear!” That is work but worth it and a sign of a good chef! And you’re very accomplished in the kitchen to notice! Thanks, David! My wife cooks a package (or two) of chicken giblets (gizzards & hearts) separately, rinses them and then adds this to the soup mixture when adding the bones chicken to the soup. Dear Lois, being a Polish housewife I follow your blog with immense pleasure:) A little rosół tip – burn the onion on a hot dry frying pan before adding it to the water, this ensures deep golden color and enhances flavor. All the best ! I’ve been looking for a recipe like this for a long time. I’m going to practice & then make it for my daughter & her husband when I visit them in Arizona for Christmas! Thank you! Hi I am making the soup right now for a Chicken Soup challenge at our Elks Lodge. When do I remove the chicken? Hi Katherine, The chicken comes out when you strain out all of the other bones. Then you’ll pull the meat off the bone and return the meat to the pot. I hope you and your friends enjoy the soup! That makes my day! Thanks for letting me know.